Ceramic matrix composites (CMC) have been considered in the last two decades to be alternative materials for highly demanding thermo-structural applications. Pre-ceramic polymers offer significant advantages for manufacturing these composites by the polymer impregnation method. In the present work, carbon fiber/silicon oxycarbide (C/SiCxOy) composites were obtained by controlled pyrolysis of carbon fiber/bridge polysilsesquioxane composites (COMPOSITE 1) followed by infiltration/pyrolysis cycles with a polycyclic silicone network. The polysilsesquioxane showed high wettability and adhesion on the carbon fiber surface. An improvement of the thermo-oxidation resistance and a reduction of the porosity as a function of the number of polycyclic silicone infiltration cycles were observed. An extra improvement in the thermo-oxidation protection was found when the C/SiCxOy composite was coated with a poly(phenylsilsesquioxane) layer (COMPOSITE 2). Shear properties for the composites showed a dependence on the nature of the matrix. 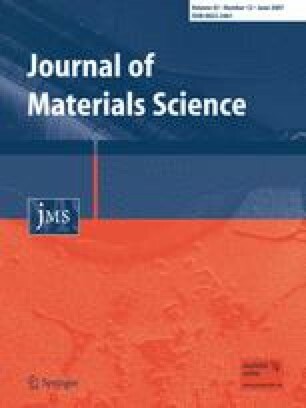 The average in-plane shear strength and the shear modulus were 44.2 ± 1.9 MPa and 2.2 ± 0.5 GPa for the polymeric matrix composite (COMPOSITE 1), respectively. For the ceramic matrix composite (COMPOSITE 2) the values were 14.2 ± 4.1 MPa and 15.0 ± 2.0 GPa, respectively. The properties of the latter composite were also governed by the microstructure of the ceramic matrix. We gratefully acknowledge financial support from CNPq and FAPESP (Process 00/06882-5).